Reposted from Downtown St. John's News Release, July 30, 2018: Historic downtown St. John’s is the heart of our city. Downtown has always been a hub for culture, arts, entertainment, shopping, and commerce — with the best retail shopping, dining, tourism, hospitality, and so much more. We know there’s always something on the go and now we want to share what’s on the go with all of you! Downtown St. John’s, in partnership with the City of St. John’s, has developed a ‘Love Downtown Celebration’. This ‘Love Downtown Celebration’ is a campaign that has the shared interests of the many stakeholders in our downtown community at heart. Over the last number of days, organizations of various types who operate within our Downtown core have been replying to a survey link we sent them where they have listed all their events that are coming up between now and the end of September…think craft fairs, music festivals and shows, grand openings, guest speakers, sidewalk sales, open houses, movie nights, carnivals, and much much more! We have complied all of this data to create the Love Downtown Celebration, an event-focused website and promotional campaign that will run from now until the end of September. This new web site, www.lovedowntownstjohns.com will be your one-stop-shop for all that is happening Downtown. 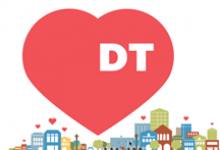 In addition to this web site, a new Love DT logo, poster, stickers, buttons, as well as a huge social media campaign have been developed to support the Love Downtown Celebration. Downtown St. John’s Executive Director Scott Cluney stated, “Downtown St. John’s has always been considered to be the celebration destination in the City, our Love Downtown events-driven campaign just makes it that much easier for everyone to find the fun and stay in the know. We would like to thank all of the businesses and organizations who contributed to this initiative, including the Folks Arts Council, RANL, George Street Association, Music NL and many more”. You can be a part of the Love Downtown Celebration too. If you or your organization is having an event Downtown you can visit our www.lovedowntownstjohns.com page and enter your own event where it will be reviewed and added to the list. And what’s a celebration without give-aways!!? Show us your love for Downtown and we will love you back!! Over the next 10 weeks be sure to come Downtown to look for our giant ‘street heart’ which will be at various special events and locations through the area. Get your picture taken with our ‘street heart’ and post it on Instagram, Facebook, or Twitter with the hash tag #lovedowntown for your chance to win prizes that will be given away every Friday. It’s going to be the celebration of the summer….don’t miss it!